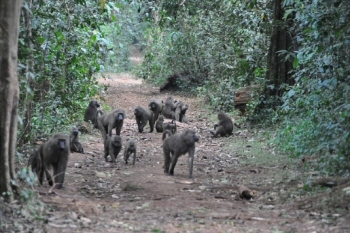 The jungle rainforest of Kibale Park is a area for primate tracking within East Africa. It’s an amazing and rewarding experience to trek chimps. 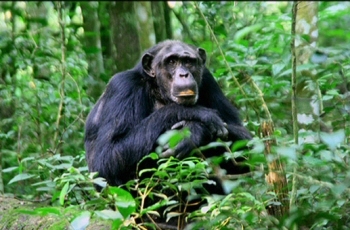 Taking a chimpanzee safari within Kibale, will give you an opportunity to explore the jungle, swamps as well as the grassland around this forest. This 30 minutes forest walk is worth taking to Kibale, the trees, birds, butterflies as well as trees. The distinctiveness of Kibale Forest is it is one of the perfect places for Chimpanzee tracking safaris within East Africa and worldwide. On the forest walk searching for Chimps you will also see some other forest animals such as elephants, hippos, warthogs, buffaloes, huge forest hogs, leopards, and lions plus birds species. The park is a habitat to around 13 different primates, which is the highest number in East Africa such as the Grey Cheeked Mangabey Monkeys, Olive Baboon Monkey, Blue Monkeys, Black and White Colobus, Red Colobus Monkeys, L’Hoest’s Monkeys, Red Tailed Monkey, the Grey Vervet Monkey and Chimpanzees. The forest is a natural environment much like the western Africa lowland forests as well as Afro-montana. Most tourists visiting Kibale Forest with the reason for tracking chimpanzees and this forest has a lot more to offer with a wide diversity not recognizing all the extra Africa natural amazing things encountered in this forest Kibale. Other than primates you will find 351 shrubs plus tree species, butterflies, birds as well as mammals. This is evidence enough for you to book a chimp tracking in this amazing jungle forest. Bigodi Village plus community tour: Bigodi community walk takes you to the homesteads in the local communities close to the park. On this village walk, you’ll be escorted by one of the locals who is very knowledgeable about the norms plus cultures of the different tribes here. You will have a door-to-door village tour and aslo visit the churches and the community schools .The walk will familiarizes you with the village lifestyle of these African people in this remote area. Head back to your lodging for dinner and the overnight. Enjoy an African bush breakfast before setting out chimpanzee trekking in the forest. This will be a satisfying day in the middle of Africa as you chimpanzee tracking trip within Kibale forest park. Other than the Chimpanzees and other primates, is a rich bird life and butterflies here. Return to your lodging for lunch before going for the afternoon Bigodi Swamp hike. You will begin your guided Adventure in the Bigodi Wetlands Sanctuary on which walk you will see various birds and animals. This Bigodo swamp walk is very popular just as the Chimpanzee forest walk. We recommend that you wear comfortable walking shoes as this walk will go through some muddy places. If lucky you may spot the shoebill stork as well as the hard to see Sitatunga Antelope. You will also come across a number of primates here, and occasionally see the chimpanzees too. Dine and slumber at your lodge.